Also available in other formats (below). "If everyone would just listen to this recording and apply the concepts it contains, I believe everyone could solve their financial worries forever." You don't have to win the lottery or inherit a fortune from am distant relative to become wealthy. The latest scientific evidence suggests that you can do it all by yourself, without inside connections, vast business experience, or even luck! A recent University study of a cross-section of several thousand people revealed something very interesting about personal success. It concluded that exceptional gifts, such as talents, unique abilities and intelligence were very equally distributed between people with high and with average incomes. In other words, there is no such thing as an inherited propensity toward success or wealth. In fact, average and wealthy people seem to be remarkably similar. However, a handful of slight differences did emerge. Virtually all of these differences were confined to behavior variations - the one area that psychologists tend to agree is the easiest for us to change. To put it another way, the study would seem to suggest that by learning to behave the same way that wealthy, successful people behave, you can become one of them. 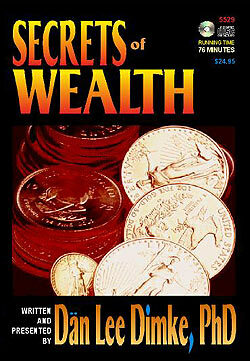 "Secrets of Weath is an excellent product and is a must for anyone who wants to achieve financial freedom." In this audio Compact Disk (CD) presentation, Dr. Dän Lee Dimke (who grew up in the family of a self-made millionaire himself) brings a unique, inside perspective to the discussion of the Secrets of Wealth and how to master them. You'll discover how making subtle changes in the way that you think, and plan, and act, privately as well as in social settings, can dramatically transform your income, your personal power, and your long-term prosperity. Using a simple method, called the other side of the mirror technique, you can benefit from everything that happens to you, whether it initially appears good or bad. Using examples from successful people throughout history, watch this powerful system in action, turning success and adversity into profit. It has been used to amass some of the largest fortunes ever built. And, it can do the same thing for you, just as reliably, just as certainly, just as quickly. This is the life-altering technique that will make you rich. Learn the most powerful wealth-building technique ever devised. Discover the secret of producing runaway prosperity while enjoying personal happiness. Develop the unshakable self-confidence you'll need to acquire and hold onto wealth...and more! Another powerful technique let's you turn the things you like doing most into a virtual money machine that generates profits for you day and night. You'll also learn what some of the most successful men and women in history had to say about money, prosperity, and happiness, and how they were able to obtain and keep these precious commodities using a simple formula that you can begin using yourself, today. "I am very pleased with Secrets of Wealth. I would like to congratulate Dr. Dimke and Future World for the excellent presentation quality and inspirational content."